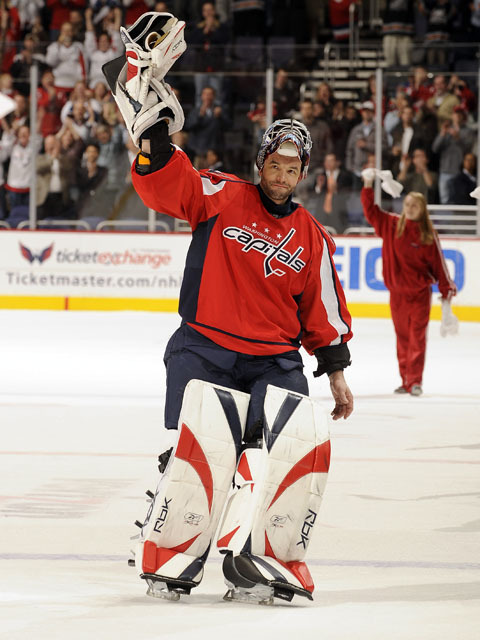 WASHINGTON (AP) -Olie Kolzig's 300th NHL win came with a little help from Alex Ovechkin. Ovechkin scored his NHL-leading 55th and 56th goals, including the tiebreaker with 1:54 left, and the Washington Capitals beat the Calgary Flames 3-2 for Kolzig's milestone victory. 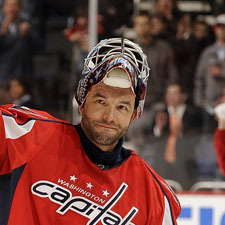 With the Capitals trying to keep realistic hopes alive for a playoff spot, Kolzig had little chance to focus on his accomplishments in 17 seasons with Washington. Kolzig is the 23rd goalie to win 300 NHL games. "I think it'll set in a little more when the season's over, or my career's over," Kolzig said. "I kind of just approach it as a playoff game for us. We're in a must-win situation every night, and it just happened that tonight was my 300." The Capitals started the night seven points behind Carolina for the Southeast Division lead and six points away from the eighth playoff spot in the Eastern Conference. Washington has 11 games left. "We know how hard we have to work here to give ourselves a chance," said defenseman Mike Green, who assisted on Ovechkin's two goals. "The rest of the games are so important, and we're so hungry. We want to win so bad." Washington made its task even tougher with two difficult losses last weekend, including a 4-2 defeat at Pittsburgh when a failed clearing pass by forward Nicklas Backstrom ended up in his own net. "It was huge to get this win," Kolzig said. "It was good to get this game to get rid of the demons from the weekend and move forward." Ovechkin broke a 2-2 tie with a power-play goal in the closing minutes. He fired a shot from just inside the blue line, slightly to the right of center, that got past goalie Miikka Kiprusoff. Ovechkin's 56 goals this season are 11 ahead of the No. 2 scorer, Atlanta's Ilya Kovalchuk. "He's done that for us all year long," Kolzig said. "I think if we get in, I think he should be hands-down the MVP." Ovechkin's first goal came on a second-period power play to get the Capitals even at 2. A clearing attempt by Calgary on a loose puck in front of the net went straight to Ovechkin in the left circle. He promptly put a shot in with 2:05 left in the period. "I thought in the third period, when we knew it was going to be right there, they pushed harder than we did but we also gave them the puck all over the ice," Calgary captain Jarome Iginla said. "It's pretty nice to play that way, when the other team just keeps giving it back to you." Washington opened the game with a goal in the opening minute, but the Flames scored twice with the help of two 5-of-3 power plays. The Capitals took a 1-0 lead when Victor Kozlov redirected Backstrom's shot for his 15th goal just 53 seconds in. The drive came from just past the blue line on the right side, and Kozlov was just outside the crease when he tipped it past Kiprusoff. Iginla slapped a shot past Kolzig from the top of the left circle with 45 seconds left in the first period to tie it 1-1. The Flames took the lead at 8:57 of the second period as another two-man advantage expired. John Erskine took a tripping penalty at 6:57 and Shaone Morrison followed with another one at 8:22. Kristian Huselius scored his 23rd goal exactly two minutes after Erskine's penalty, officially making it a 5-on-4 goal, but the shot came against a three-man defense. Dion Phaneuf earned his second assist of the game. Washington ended its slide against a team that had been rolling. Calgary was 7-1-2 in its previous 10 games. "It was a good character game," Capitals coach Bruce Boudreau said. "It was a good jump start." Notes: This was the only meeting of the season between the teams. ... Washington is 6-0 with two ties against Calgary since March 13, 1999. ... The game was broadcast on two channels in the Washington area. One carried the regular game broadcast, while the other had a split screen with the regular game coverage on one side and a dedicated camera continuously following Ovechkin on the other. The feature was dubbed OvechKam. "I don't think about OvechKam," Ovechkin said. "For me it doesn't matter, OvechKam or different camera." ... Former Rangers goalie Mike Richter is next on the wins list with 301.